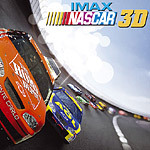 NASCAR 3-D: The IMAX Experience promises to put you in the driver’s seat. But this 40-minute documentary goes inside the cars for only a couple of minutes; the rest of the movie is padding and filler. The movie manages to stay entertaining, but pure thrillseekers may be disappointed. Narrated by Keifer Sutherland, NASCAR 3D IMAX uncovers the history of the National Association of Stock Car Automobile Racing (NASCAR). It also takes us behind the scenes at the giant complexes where the cars are built. It takes us into the pit and out among the crowds who pay hundreds of dollars each for tickets to the races. And yes, it even puts us inside speeding cars that race around the track only inches apart. That’s a lot of information to cover in only 40 minutes, but it’s comparable to the information packed in other IMAX documentaries. In fact, it looks a lot like any other IMAX movie, which is a mild disappointment. For some reason, I expected this commercially-produced film would be different, more exciting. Nevertheless, there’s a lot to be said for the IMAX style of documentary. Flitting from one angle on the story to another keeps you wanting just a little more and keeps the pace brisk and peppy. By not delving in any one place too long, the writers and editors can present the most interesting factoids and quickly move on. As with most IMAX movies, you won’t learn anything in depth from NASCAR 3D IMAX, but it’s good infotainment. The 3-D photography is outstanding (literally). Wide-angle shots of huge crowds let you pick out each individual fan, while the footage of workers assembling the cars makes you think you can grab a cam shaft. Great photography is featured in a re-enacted chase scene (some early NASCAR drivers started their careers as bootleggers), set on a rural dirt road in North Carolina. Ironically, the footage from inside the race cars is probably the least impressive. The movie saves “the best” for last, but the race day footage, which ought to be the most exciting stuff, is anticlimactic. That might be because footage from different races is intercut. One shot will be set at night, then we cut to a daytime shot at a different track. If I had to guess, I’d say that the filmmakers were unable to change film in the cameras once the racers started, and so they were limited to 30-90 seconds of film from each race, making it impossible to tell a gripping story of who won. And although the photography is good, the 3D editing is problematic. Every time there is an edit, your eyes have to re-adjust to the new scene, particularly if different lenses were used on the cameras (telephoto lenses result in a cartoonish paper-cutouts look, where wide-angle lenses make things seem more real). Fewer edits and longer takes are better than many quick cuts, but that isn’t always possible, as with the final race-day montage. Nevertheless, it’s a treat to see 3-D done well, and overall NASCAR: The IMAX Experience is such an example. It’s too bad the racing footage wasn’t more prominent or amazing, but for sheer size and bravado, it still deserves a look.